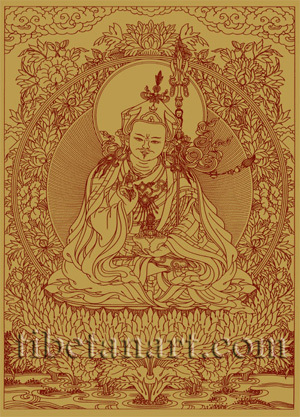 Open edition of signed Guru Rinpoche (Padmasambhava) screen prints available in A3 size (16 x 11.7 inches). Guru Rinpoche, the 'precious teacher', is also commonly known as Padmakara or Padmasambhava, the 'lotus-born' tantric mahasiddha and 'second buddha' from Uddiyana in western India, who is recognized as being the principal instigator for introducing the Indian Buddhist teachings into Tibet during the eighth century. This drawing I first made in 1974 as a preliminary sketch from a Guru Rinpoche thangka painted by my teacher Khamtrul Rinpoche, when I was painting for him in Tashijong, India. I use the word 'sketch' as there were no photocopy machines in those days. This finished drawing I made in 1988, and I am still pleased with its fluidity and 'presence'. Padmasambhava is shown here in the more benign of his two principal forms, as he sits in vajra-posture upon a white moon disc above a golden sun disc, which rests within the pericarp of an immaculate lotus of a thousand-petals that arises above the clear waters of a lotus-lake. The moon and sun discs represent the unity of his method (moon) and wisdom (sun), and his thousand-petal lotus represents his complete purity from all the defilements of cyclic existence. He is youthful like an eight or sixteen-year-old prince, with a flesh coloured reddish-white complexion, 'like the rising sun shining on snow mountains', and he is endowed with the thirty-two major marks and eighty minor signs of an enlightened chakravartin or universal monarch. His facial expression combines the sentiments of slight wrath and joy, with two piercing lotus-like eyes, a graceful furrow between his eyebrows, a thin moustache, and a small chin beard. His lips are ruby-red in colour, and within his mouth are forty neatly arranged white teeth, and his soft red tongue. Upon his head he wears the 'lotus-hat' that was presented to him by the King of Sahor, the father of his Indian consort, Mandarava. This lotus-hat has five flaps that are lined with the white fur of a wildcat and a protective edging of blue fabric, while the directional colours of the flaps indicate his four-fold activities of pacifying, enriching, controlling and destroying. The front flap of his hat is marked with a triple-gem symbol, and above this is the crescent moon and sun disk that represents his triumph over the darkness of ignorance. The top of his hat is adorned with five-coloured silk ribbons, and the crowning emblem of a golden half-vajra with two vulture feathers and a central peacock feather ascending above it. The vajra symbolizes his meditative stability, the two vulture feathers represent the perfection of his spiritual view and attainments, and the peacock feather represents the luminosity of the dharmadhatu from which mind and all phenomena arise. As garments Padmasambhava wears three different coloured robes and a fur-lined brown cloak. His inner or 'secret robe' is white in colour to represent his perfection of the Bodhisattva and Dzogchen paths or vehicles. Above this he wears a blue robe to represent his perfection of the Mantrayana or tantric vehicle, and the outer collar of this robe is lined with a curved edging of red copper. Above this he wears the patched orange and red robe of a Buddhist monk to represent his perfection of the Sutra or Hinayana vehicle. The heavy brown cloak symbolizes his perfection of all vehicles or paths to enlightenment, and his ornamented felt and leather shoes represent his regal nature. Coils of his blue-black hair hang freely about his shoulders, and he wears the golden ornaments of earrings and necklaces. With his right hand Padmasambhava holds a five-pronged golden vajra in front of his heart, symbolizing the indestructible nature of his wisdom-awareness and emptiness, and his uninterrupted meditation upon bliss and emptiness. His left hand rests upon his lap in the dhyana-mudra of meditation upon emptiness, as he supports in his palm a white skull-cup filled with the deathless nectar of immortal wisdom, which symbolizes that he fully delights in the resources of the five senses, since he has transcended the duality of appearance and emptiness. Encircled by the skull-cup's swirling nectar is a nectar-filled golden longevity vase, which is embellished with four leaf-shaped directional pendants, and sealed on its aperture with the emblem of a small wish-granting tree, or a gold-mounted gemstone that is sealed with the red syllable HRIH of Amitabha Buddha. These symbols represent that he has attained the highest level of a vidyadhari or 'awareness-holder', with full control over his lifespan. In the crook of his left arm he supports the upright shaft of his khatvanga, which is fashioned from a knotless length of black bamboo, and represents how the teachings are all ultimately unified within a single vehicle. The top of this shaft is surmounted by a golden crossed-vajra, the four five-pronged heads of which represent the ease with which he performs the four activities or rites of pacifying, enriching, controlling and destroying. Usually this crossed-vajra is depicted in a half-section because it is fixed horizontally to the top of the bamboo shaft and is surmounted by a small golden flask, which represents the nectar of non-conceptual awareness. An auspicious billowing white or pale yellow silk ribbon is tied around the base of this flask to represent the unified nature of the various vehicles, and hanging behind this on a thin golden chain are the small emblems of a rattling damaru or pellet-drum, a tinkling silver bell, a sun and moon symbol, and a red yak-tail pendant. The damaru and bell, moon and sun, represent the union of method and wisdom, and the yak-tail represents the supremacy of the Buddha's teachings. Three impaled heads appear above the aperture of the flask: the first is a freshly severed head moist head that is either blue or red in colour; the second is a green or pink decaying head; and the third is a dry white skull. Collectively these three heads represent the three kayas: nirmanakaya (red head), sambhogakaya (blue head), and dharmakaya (dry white skull). Towering above the skull is the blue iron shaft of his sharply pointed and fire-tipped trident, with six interlocked rings hanging from its side prongs. The six rings represent the six perfections of: generosity, discipline, patience, perseverance, concentration, and wisdom or discriminating awareness. The three prongs of the trident symbolize his triumph over the three worlds, the three times, the three poisons of ignorance, craving and aversion, and the three principal channels or 'psychic nerves' of the subtle-body. Rays of golden light emanate from his radiant body and scintillate against the deep blue expanse of his inner aura, which is surrounded by a profusion of lotus blossoms, buds and leaves, and an outer orb of five-coloured rainbow light.